Screenshot of vacant parcels from GTECH data set. Today, Saturday, June 6, 2015 is the National Day of Civic Hacking. Civic Hacking events are being held all over the country and here in Pittsburgh. For the afternoon we have split into groups and are working on different challenges with open data sets. My group is working on comparing two data sets about vacant land on the North Side. Here are some of the things we learned from the data about vacant land on the North Side. Data Set 1: Survey of Vacant Land on the North Side conducted by GTECH. You can see a map of the GTECH data here. How many properties in the North Side are currently vacant but the Allegheny County Assessment file does not list that parcel as vacant? 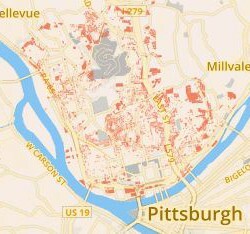 622 properties in the North Side are currently vacant but not listed by Allegheny County as vacant.